Barry Barnes as Constable James O'Brien in RTÉ's Rebellion. THE SECOND EPISODE of RTÉ’s Rebellion featured a tense scene in which an unarmed policeman was shot dead at the gates of Dublin Castle. Now, the TV show is a fictional portrayal of the events surrounding the rising, it’s not meant to be a historical thesis. But some have been asking about what’s true and what isn’t, so here’s what we know about that particular incident. Firstly, the policeman shot was indeed a real person and is in fact believed to be the first casualty of the uprising. According to Jim Herlihy’s 2001 book, The Dublin Metropolitan Police, A Short History, the constable was named James O’Brien and hailed from Kilfergus, Co. Limerick. The book says that O’Brien was born in 1868 and had 21 years of service with the Royal Irish Constabulary (RIC) when he was shot. The man who shot him is also known and was also the first rebel killed during the rising. 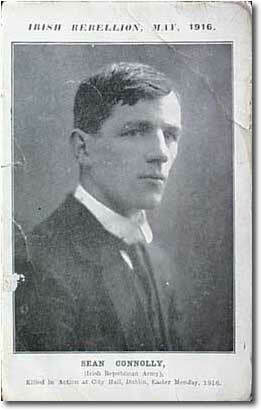 He was Captain Seán Connolly of the Irish Citizen Army. According to the 2011 book, The Easter Rising by Michael Foy and Brian Barton, Connolly was only shortly beforehand promoted to the rank of Captain by James Connolly. He was given orders to lead the Citizen Army’s occupation of City Hall. After James Connolly shouted, ‘Good luck, Sean! We won’t meet again’, the column of thirty men set off along with a dozen women who had slipped in at the last moment. So far, so accurate, the Rebellion version shows the Citizen Army column marching up towards the Cork Hill Gate at Dublin Castle. This gate is at the entrance beside City Hall and is exactly where the incident happened. In the fictionalised version, there follows a dialogue between Connolly and O’Brien with Connolly telling O’Brien to open the gate “in the name of the Provisional Government of the Irish Republic”. The policeman is shown to refuse numerous times saying, “the gates are open but not to the likes of you bowsies”. Connolly is then shown to point a gun at the unarmed constable before giving him a “last warning”. O’Brien then responds in kind with a similar threat before he is shot. But did this conversation actually happen? According to Foy and Barton, the actual incident happened much more quickly with O’Brien attempting to close the castle gate on the rebels before being shot. As the Citizen Army approached City Hall at noon, sections peeled away to occupy the designated buildings but Connolly’s continued towards the Upper Yard entrance to the Castle. The policeman on duty, Constable O’Brien, signalled for them to pass on and went to close the gate but Connolly shot him dead. An armed sentry nearby made as if to return fire but thought better of it and ran to the guardroom. I, with my girls, followed Seán Connolly and his party. We went right up to the Castle Gate… Just then, a police Sergeant came out and, seeing our determination, he thought it was just a parade… When Connolly went to get past him, the Sergeant put out his arm and Connolly shot him dead. When the military guard saw that it was serious, he pulled the gates to. ‘Get in, get in’. He was excited because he had shot the policeman dead. We were all in excitement. When I saw Connolly draw his revolver, I drew my own. The aftermath of the scene was also described by Dr Kathleen Lynn. She arrived at the castle yard with Countess Markievicz. Irish Home Ruler Thomas Myles was also there but was not with the pair. As I arrived I saw the dead body of a big policeman lying on the ground – it seemed to be in front of the castle gate. 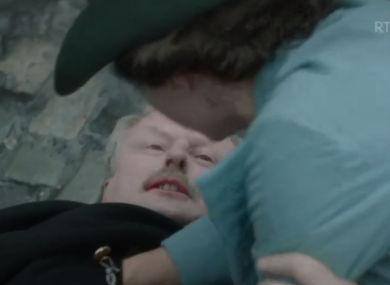 Just then Sir Thomas Myles came up, evidently going into the castle, and I still remember the look of horror on his face when he saw the body. I don’t think he noticed me. It was a beautiful day, the sun was hot and we were not long there when we noticed Seán Connolly coming towards us, walking upright, although he had been advised to crouch and take cover as much as possible. We suddenly saw him fall mortally wounded by a sniper’s bullet from the Castle. First aid was useless. He died almost immediately; that I think it was in the early afternoon. Jinny Shanahan whispered an Act of Contrition in his ear. Email “Was an unarmed policeman really shot dead at Dublin Castle during the Easter Rising?”. Feedback on “Was an unarmed policeman really shot dead at Dublin Castle during the Easter Rising?”.